These steps describe how to set up your email account using Outlook 2013 or Outlook 2010 on your PC. NOTE If you’re using Outlook 2010 with Office 365 for business, you need to set up your desktop before you can set up Outlook to access your account. See Use my current Office desktop apps with Office 365. Open Outlook 2013 or Outlook 2010. When the Outlook Startup Wizard opens, select Next. On the E-mail Accounts page, select Next. 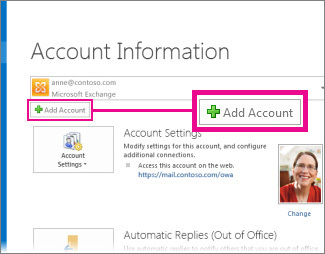 If the Wizard didn't open or you want to add an additional email account, on the Outlook toolbar select theFile tab. If your account didn't automatically set up, Outlook may ask you to try again using an unencrypted connection to the mail server. If that doesn't work, you can use the manual setup option. See Add an email account with custom settings or when automatic setup doesn’t work.